Why is visual merchandising for site search important? Site Search in your online store is the most important conversion funnel. Visitors with intent use the search funnel and a data-driven site search engine that predicts what products will sell is a minimum requirement to get the best conversion rate. This is what Tagalys Search was back in 2017 when we used data to predict the best products for any search query. Then why did we add a visual merchandising panel if the engine is supposed to optimize conversion? All site search engines rely on data collected from the e-commerce store to make sense of it. Think of data as fuel to the engine and the main differences across various engines like Klevu, Nextopia, Sli and the others is the duration or the amount of fuel used in the engine and the engine itself. The limitations of search engines based on historical data are it does not tell you anything about this moment, but makes predictions only based on past behavior. Today matters because sometimes marketing campaigns are based on immediate trends and not something that happened 2 weeks back. For example and this happened at a fashion retailer we currently work with. A certain celebrity was found wearing a palazzo & top from this designers collection and it because of a rage online. Now almost everyone at the online store was trying to find that product as it was trending across Twitter, Instagram & Facebook. 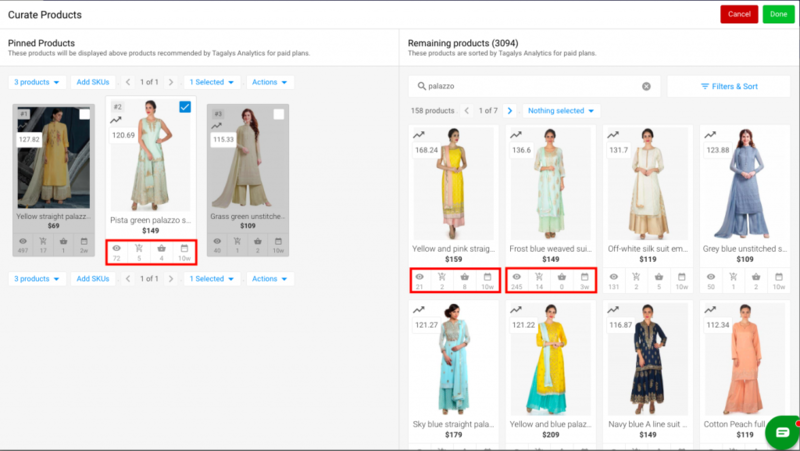 But none of these trends are passed to the online store programmatically and that SKU was not the first product visitors saw when they search for “Palazzo” or “tops”. This is when our customers & product team realized the shortfalls of only using historical data. Tagalys provides retailers with a visual panel to instantly choose products for a search query and ensure they positioned such that the visitors find them. 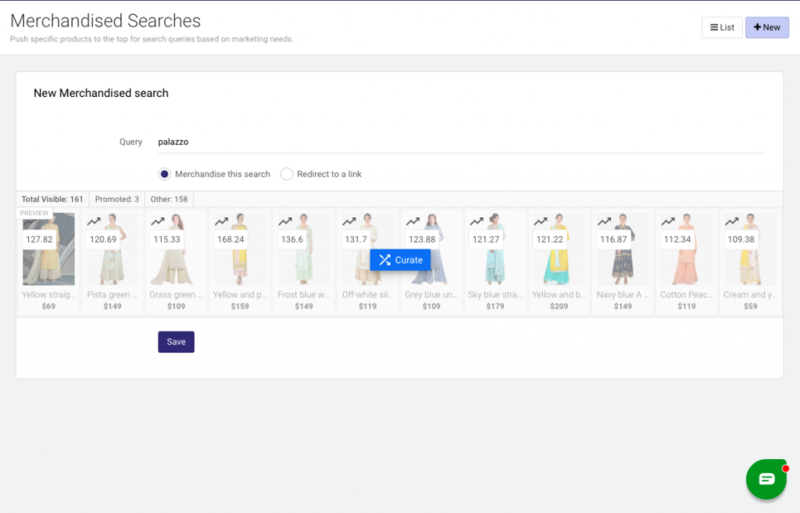 As soon as we launched the visual merchandising panel, retailers & their stylists started using it changing the sort order of products in multiple searches. The freedom to control products displayed empowered retailers to a point where sometimes it started to negatively impact the conversion rates. We realized that merchandisers started promoting products based on gut and not only data. The purpose of the panel was to promote products that matched external data trends that were not part of Tagalys, but it was being used differently. Hence we then added real-time product insights for every product, so retail teams could consider historical product performance before making a merchandising decision. A merchandising panel for site search by itself is not going to boost conversion rates. We recommend our clients to only merchandise the searches that have external trends not part of the store. Typically that is usually less than 5% of the overall unique search queries, hence the final impact to the conversion rate is less than 20%, depending on the total number of searches for the merchandised search terms. For the client shared in the above example, the merchandised search itself generated over $77,000 in revenue as the external trend lasted over 4 days.